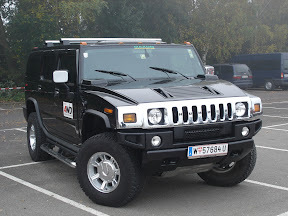 The Hummer may have gone the way of the dodo, but even a greener lineup can't keep G.M. sales up. Image from Wikimedia Commons. The Big Three domestic automakers have been desperate to recapture the market share from foreign auto firms. Since the recession began, all three firms have been trying to boost the bottom line and get more people buying American again. The auto rebate offered by the government for buying more fuel efficient vehicles helped. General Motors saw improved sales, assisted by the Cash for Clunkers program, but by August 2009, GM sales have slowed. Consumer confidence is down across nearly all categories of goods, including real estate. General Motors has returned to profitability and is close to filing for an Initial Public Offering and paying off the portion the company owes for the auto bailout. However, the expiration of the Cash for Clunkers auto rebate credit has led to a drastic decrease in sales over this summer. GM sales have dropped 25 percent since August 2009, according to the New York Times. A decline in sales, though, was somewhat anticipated. General Motors did shutter or sell all but four of the brands the company makes. It is anticipated that consumers have been waiting for Labor Day sales to get better prices. Along with General Motors, Ford sold fewer cars over the August 2009 to August 2010 period. Both automakers were likely helped by consumers — who could afford to or had access to credit — buying more fuel efficient vehicles and taking advantage of the tax rebate. Ford sales over the last year fell 11 percent. However, Chrysler actually increased sales by 7 percent. Auto sales are at the lowest levels in decades. Last year, the auto industry sold 10.4 million cars, and this year’s sales are expected to crack 11 million. The seasonally adjusted sales rate for August 2010 was 11.5 million, though August 2009 was 14.1 million. There isn’t an industry not affected by consumer confidence right now. Real estate is abysmal, but the auto industry is slowly improving. New green vehicles are expected to sell fairly well, but unless more people feel safe enough to buy a new Dodge, Ford or Chevy, sales are going to be sluggish at best for some time.